Senior & Shopmaker is pleased to present Brice Marden: Prints, a selection of the artist’s graphic works spanning the years 1973 to 2001. Since the beginning of his printmaking career in the late 1960s, Marden’s physical engagement with materials along with the presence of an organizing grid or structure, even in the organic linear compositions of his later work, have been integral components. This exhibition includes Five Plates, 1973, a series of large-scale aquatints with etching that relate to Marden’s Grove Group paintings of the early 1970s, inspired by the Greek landscape and notable for their dense and opaque monochrome surfaces. The solid geometry of Five Plates gives way by 1979 to the open grids of Tiles, a set of four etchings derived from the artist’s idea for the making of ceramic tiles. Marden used a twig dipped in sugar solution to draw on the plates—a method that he began to explore more fully in the calligraphic, Asian-inspired imagery which developed during a major stylistic transition after a trip to the Far East in the mid-1980s. The zenith of this looser drawing style is found in Cold Mountain: Zen Study 1, 1991 from a series of six, large plate etchings characterized by meandering, intuitively drawn lines that are discretely organized into distinct vertical couplets and connected glyphs. The series title and its forms refer to writings by the celebrated poet Han Shan, known as “Cold Mountain,” who was active in China during the Tang dynasty (618–907). In After Botticelli I, 1993, Marden adapted the serpentine lines of the Florentine Renaissance master Sandro Botticelli, celebrated for his use of line both to ornament and to convey movement. The vertical forms that appear in the etching refer to distinct columnar figures. 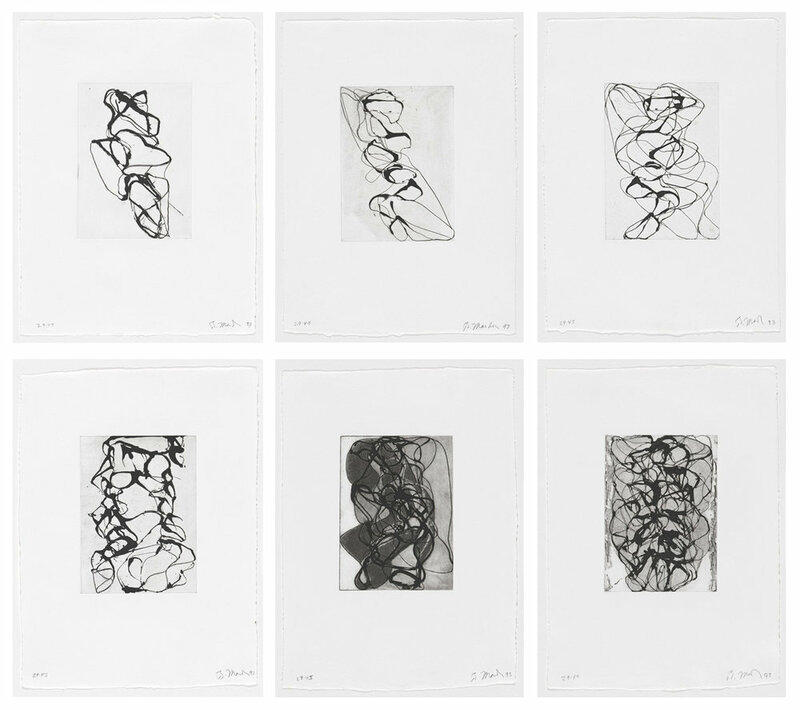 Also dating from 1993 is Han Shan Exit (1-6), a set of six etchings marked by increasingly fluid linear compositions. Line Muses, 2001 in some ways reconnects with Marden’s early minimal work. The line work meanders uniformly across the entire picture plane with no suggestion of figures, landscape, or characters, revealing the artist’s roots in Abstract Expressionism. Brice Marden was born in 1938 in Bronxville, New York. In 2006, the Museum of Modern Art in New York organized a major retrospective of his paintings and drawings, which later traveled to the San Francisco Museum of Art and the Hamburger Bahnhof in Berlin. Marden lives and works in New York.